As promised, here’s a recipe for a peanut butter caramel corn. I drizzled chocolate on half of it and a mixture of melted peanut butter chips and coconut oil on the other. It turned out exactly as I was hoping and had a nice, crispy texture. To get the crispy texture I used the basic Betty Crocker Oven Baked Caramel Corn formula of 1 cup sugar, 1/2 cup butter and 1/4 cup syrup, but used a mixture of regular and brown sugar in place of just brown (to downplay the molasses) and added 1/4 cup peanut butter. For the first batch I used Jif, which has sugar. For the second, I used Trader Joe’s peanut butter, which does not have sugar. Both types of peanut butter worked, but the batch made with the unsweetened peanut butter was looser and less shiny and had a slightly stronger peanut flavor. It was excellent, but it was almost too rich to accommodate the chocolate drizzle, so I recommend sticking with mainstream sugar-added peanut butter if you’re going to add the drizzle. Crisp peanut butter coated popcorn drizzled with melted milk chocolate. In a saucepan (I used a 3 quart), combine the softened butter, both sugars, corn syrup and peanut butter. Set over medium heat and cook, stirring continuously, until mixture begins to boil. Allow mixture boil steadily for about 5 minutes. Remove from heat and stir in vanilla and baking soda. Pour over the popcorn and stir to coat. Bake the caramel corn for about 55 minutes, stirring every 15 to 20 minutes. Allow the caramel corn to cool completely, then break it into chunks. Put the chocolate chips and shortening or coconut oil in a heavy duty freezer bag. Make sure it is a freezer bag and not a regular zipper bag. Microwave at 50% power for 30 seconds. Massage bag to soften chips. Repeat until chips are melted and smooth. 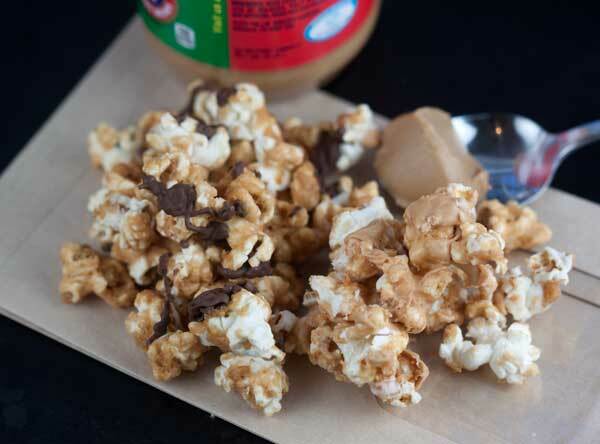 Snip off the bottom corner of the bag and squeeze melted chocolate over the caramel corn. Keep it in a cold part of the room until the chocolate sets. One thing I've discovered about caramel corn is that it freezes well. It will stay fresh for a while in an air tight package at room temperature, but if you make a ton of it and don't have a lot of people to share it with right away, you can definitely keep it in the freezer. I made this the other night and it was excellent! Great caramel crunch with a mild peanut butter flavor(I did use Jif and omitted the peanuts out of personal preference). Thank you for sharing this recipe! Wow – I can tell you I definitely won’t make this unless I have a crowd to eat it! I love peanut butter chocolate anything and that will test my willpower beyond its limit!